To Smoke, or Not to Smoke… Is It Really a Question? Whether you are a smoker or not, the FDA’s new packaging requirements will surely capture your attention, make you consider quitting or inspire you to help someone you know quit. 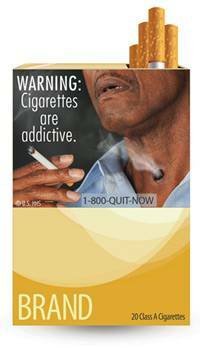 The goal of the new labels is to prevent children from smoking and encourage those who already smoke to stop. The labels will consist of nine different text warnings with corresponding images. Click here to get a sneak peak at all of the packages (not for those with weak stomachs!). While I am not a smoker, I believe the new packaging will be hard for anyone to ignore. With such a dramatic change in warning size paired with the chosen graphic imagery, I think your conscience will make it tough to buy cigarettes with a horrible possible outcome pasted on the front of the box. How do you feel about the new packaging?